Should you use a Travel Agent or book online? Travel agents can save you a lot of hassles — and get you some great deals. But they don’t always offer the best prices. The internet has turned would-be vacationers into their own travel agents. Sites, such as Kayak and Expedia, and an entire app store’s worth of travel apps, enable travelers to book flights, cruises, and hotel rooms with ease. Travel agents — once a necessity to get to some far-off destination — often get cut out of the picture. But, for those of you who don’t want to spend time planning your vacation, travel agents could be a great option. Your trip may cost a little bit more – but how much is your time worth? According to the American Society of Travel Agents (ASTA), the average service fee for booking airline tickets was around $25 – do take note that airlines charge booking fees too when you call and book with them directly over the phone. And Angie’s List reports the fee for a travel agent to build an entire multi-point itinerary (like around the world or circle the pacific trips) ranges from $100 to $200. When you work with a travel agent, you can get the best deals without having to scour the web for them yourself. Travel agents not only help you plan your vacation, but they can act as your vacation advocate. They’ll find you the best prices. And if something bad happens — such as a canceled flight or a missed connection — they’ll help clean up the mess. USA Today’s Tracy Morris explains, “Online booking will show you the prices of tickets at the moment, but prices may change daily.” When you book with a travel agent, you won’t have to check your booking site of choice every day, searching for deals. The travel agent will do the dirty work for you and help you get the best deal without wasting all of that time. Not a details person? Travel agents can get everything set up, so all you need to do is show up at the airport. Furthermore, travel agents take all of the stress out of vacations. Imagine not having to worry about arranging travel, hotels, meals, and excursions. You can get what you want without having to coordinate all of the details yourself. That can end up saving you a lot of time. In fact, some studies indicate that travelers spend 30 hours researching and preparing for a trip. And many visit up to 38 sites before actually making a reservation. Have you ever gone down the rabbit hole comparing flights? Or poring over photos of hotels? How about debating over sightseeing options? Or even second-guessing your choice of destination altogether? Travel agents make a career out of easing your planning pain. Don’t want to stress about your trip? Get a travel agent to plan it. U.S. News argues it pays to book with a travel agent because a pro can eliminate the stress of vetting the countless options out there. They can also ensure you find the best option — and save money on your booking. In fact, U.S. News estimates you can save anywhere from $500 to $1,000 on airfare if you have the right agent. That can eliminate a major source of stress for budget-conscious travelers. Plus, USA Today points out a travel agent can offer insight a website just won’t provide. “An agent can guide an inexperienced traveler through foreign travel or travel to exotic destinations. While the Internet may be bursting with websites and bookings in technologically advanced areas, agents may have more knowledge of travel in areas where tourism is less developed,” the publication explains. Ultimately, it is better to book through a travel agent because they can help you immediately during emergencies. Booking online might make you end up being on hold multiple times and or having to call different numbers first before even getting a live person to help you. Travel agents will consider details that wouldn’t occur to you. Your travel agent won’t be there to remind you to pack your phone charger or remember the sunscreen – but travel agents can help head off other travel predicaments. Angie’s List notes though novice travelers might not know all the rules, “a travel agent has seen it all before. Some cruise ships don’t allow babies or children, so you don’t want to show up with the kids in tow.” A travel agent can also give you a heads-up on exchange rates. They can advise you on when (and where) you’ll run into the worst crowds. Plus, they can remind you about what you should wear when traveling to conservative countries or religious sites. And it’s their job to know everything about travel visas, necessary vaccinations, etiquette and the restrictions associated with your reservations. Can you stay flexible about when and where you travel? You might want to book your trip yourself, instead of relying on a travel agent. On the other hand, you might want to avoid booking with a travel agent if they can’t be flexible about your plans. Woman’s Day reports that staying flexible about your travel plans can cut costs. That’s the same reason why many seasoned travelers advise comparing flights on multiple dates (and in and out of a variety of airports) to see where you can get the best prices. But not all travel agents will suggest looking at alternate dates, times, or destinations. The reason why? Your savings might mean a smaller commission for them. Want to be your own travel agent? Visit sites then plug in dates you’re willing to travel and all the airports you’re willing to depart from and arrive in and you just may spend less than you thought you would on your vacation. We all have our favorite airlines. But travel agents can’t always book you on your airline of choice. Another reason to keep an open mind if you work with travel agents? They might not be able to book the airline you usually use – some airlines only offer their services on their own websites (like Spirit Air or Southwest, Norwegian Air and other smaller regional carriers). Basically, Travel Agents are required to have an International Air Transport Association (IATA) or Cruise Line International Association (CLIA) number to book airlines through their booking source, which gives them direct access to the airline’s inventory. Travel agents probably haven’t stayed at all the places they recommend. Another thing to keep in mind? Because travel agents work on commission, they might not have ever used the hotel or cruise ship they recommend to you. Most people assume when travel agents recommend Hotel A over Hotel B, it’s because they have experience with both and genuinely think you’ll have a better experience at Hotel A. But that’s not always the case. In fact, your travel agent might get some perks or a prize if they sell enough reservations at Hotel A. Of course, they probably wouldn’t recommend the hotel if it weren’t a good property in the first place. But you don’t want to forget that travel agents may have incentives to influence your travel plans in specific ways. Worried about cancellation policies? Travel agents don’t always offer the best options. Don’t think travel agents offer better cancellation policies than online engines. In the not-so-distant past, online booking engines/sites didn’t issue refunds, so travel agents were the way to go if you were concerned you’d have to cancel your trip. Now, online travel sites may offer money back even if airfare drops – depending on certain very strict prerequisites though. Just know if you do your research — and check out cancellation and refund policies — you’ll probably get just as much peace of mind booking online as you could when booking through a travel agent. The main difference though is that the Travel Agent does all the paper work for you and following up with the airlines when needing to cancel and/or file for refunds. Travel agents don’t always offer the very best prices. The Chicago Tribune reports you should never make assumptions about the cost of booking through a travel agent versus making a reservation without one. 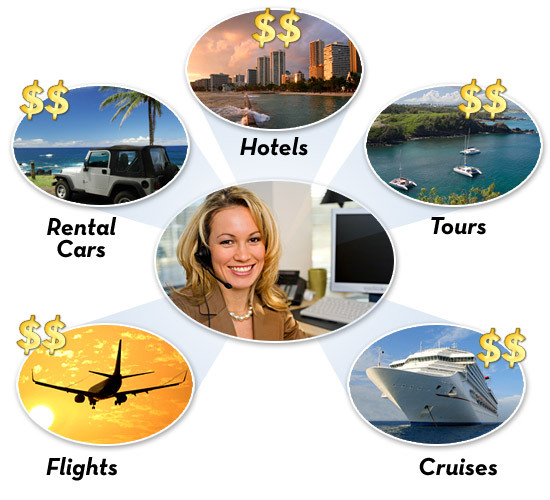 “Contrary to popular belief, a travel agent won’t always cost more. In fact, it’s possible you will pay less than booking a vacation yourself because agents might be aware of promotional offers and occasionally have access to exclusive deals,”the publication explains. Some agents charge a per-hour fee when they’re planning a trip, and agents can earn commission on some of their bookings. Plus, the Tribune reports that “agencies might charge $25 to $30 to book a domestic flight, $50 to $80 to book a vacation to a single destination and about $100 per hour for research and planning advice.” But, you can typically expect a travel agent to cost around the same as if you’d booked it yourself. When you factor in the time it saves you, travel agents might be worth the cost. In some instances try calling a travel agent when going on a cruise or land tour – they could help you get a partial rebate for what you are quoted. Twice last year a friend called and booked directly with a cruise company, and then when they were sure and about to pay for the trip, they called a travel agent friend of theirs. The travel agent got the cruise booking’s confirmation number (that the couple made directly and got from the cruise company) and called the cruise company and “claimed” the booking (so the travel agent friend could claim commission on the booking). After the travel agent claimed the booking, they then gave him their payment details and the agent issued, paid and confirmed the cruise. The travel agent gave them a check weeks later for half of the commission he received for the trips – instant discount for them. It generally only works for cruises or land tours though. Most travel agents can’t match the rock-bottom prices you can seek out online due to certain Web-Only offered deals. Ultimately, whether you book through travel agents or online depends on how you like to plan and on how you like to travel. But the Chicago Tribune makes an interesting point for budget-conscious travelers who like to scour the web for rock-bottom prices on their flights and hotel reservations. “Even with their expertise, travel agents might not get you the same rock-bottom prices ultra frugal consumers might get if they’re willing to spend the time and assume the risk of blindly bidding on airfares, hotels and car rentals at such online sites as Priceline.com,” the Tribune says.